The State of World Fisheries and Aquaculture (SOFIA) report - published by FAO on July 7, 2016 - provides a comprehensive, objective and global up-to-date data and information about capture fisheries and aquaculture, including associated policy issues. “Globally, fish provided 6.7 percent of all protein consumed by humans, as well as offering a rich source of long-chain omega-3 fatty acids, vitamins, calcium, zinc and iron. Some 57 million people were engaged in the primary fish production sectors, a third of them in aquaculture” (FAO). “One in ten people depend upon fisheries and aquaculture for their livelihoods, and we shouldn’t forget that women are key to the 2030 Agenda in fisheries” (Blue Growth blog, FAO). was released by FAO on 7th July 2016 – a couple of days before the 32nd session of the Committee on Fisheries (COFI) event & side events at FAO headquarters (Rome), to celebrate the entry into force of the The Port State Measures Agreement (PSMA) aimed at stamping out illegal fishing (watch this video). The SOFIA report provides policy-makers, managers, scientists, stakeholders and indeed all those interested in the fisheries and aquaculture sector with a comprehensive, objective and global view of capture fisheries and aquaculture, including associated policy issues. 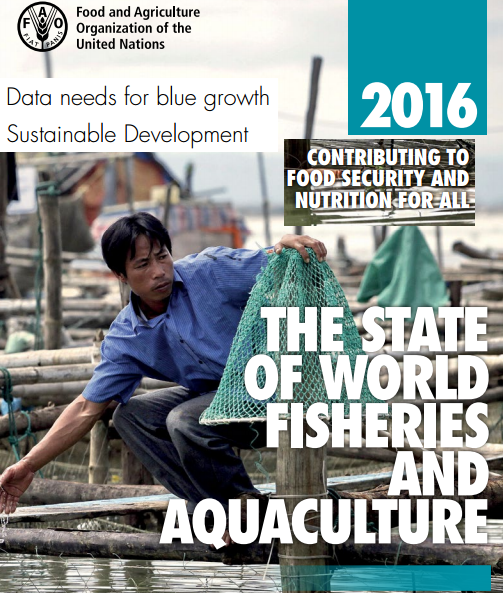 This SOFIA 2016 edition (see past editions of SOFIA) uses the latest official statistics on fisheries and aquaculture to present a global analysis of trends in fish stocks, production, processing, utilization, trade and consumption. It also reports on the status of the world’s fishing fleets and analyses the make-up of human engagement in the sector. "Life below water, which the Sustainable Development Agenda commits us to conserve, is a major ally in our effort to meet a host of challenges, from food security to climate change. This Report shows that capture fisheries can be managed sustainably, while also pointing to the enormous and growing potential of aquaculture to boost human nutrition and support livelihoods with productive jobs," FAO Director-General José Graziano da Silva. A key question is: Which will the future perspectives of development for the fisheries and aquaculture sector be? FAO emphasizes that food and agriculture are key to achieving the 2030 Agenda for Sustainable Development. Sustainable Development Goal (SDG) 14 (Conserve and sustainably use the oceans, seas and marine resources) expressly focuses on the oceans, underlining the importance of the conservation and sustainable use of the oceans and seas and of their resources for sustainable development, including through their contributions to poverty eradication, sustained economic growth, food security and creation of sustainable livelihoods and decent work. FAO is advising Members on SDG implementation policies and processes, including follow-up, monitoring and review. It is collaborating with UN-Oceans, the UN Statistical Division, the Inter-Agency Expert Group on SDG indicators, the Inter-Agency Task Force on Financing for Development outcomes and means of implementation of the 2030 Agenda, and other partners. National, regional and global efforts by fisheries and aquaculture stakeholders aiming to achieve the 2030 Agenda will benefit from past and ongoing processes of collaboration, mutual support and international consensus building. “FAO encourages the use, reproduction and dissemination of material (and data) in this information product. Except where otherwise indicated, material may be copied, downloaded and printed for private study, research and teaching purposes, or for use in non-commercial products or services, provided that appropriate acknowledgement of FAO as the source and copyright holder is given and that FAO’s endorsement of users’ views, products or services is not implied in any way” (SOFIA Report). You can also Sign in and review the Report.